Fishing has always been something that I’ve done. I was brought up, not bass fishing, but there’s always been something I’ve enjoyed doing since I was a kid. I was a really competitive-type person, so if I could combine sport with fishing, then I was all in. I’ve been all about it since I was 12-13 years old. What kinds of fish did you go for apart from bass growing up?Anything that would bite. Freshwater, mainly, but I didn’t care, Catfish, panfish…started targeting bass at 12-13 years old. Do you fish for other species in the offseason these days? I do enjoy going redfishing. Have made some trips to Louisiana, we fish for bass while we’re there, and we fish for reds, we fish for trout, basically whatever’s biting while we’re there. I love that in the part of Texas I live in, it’s good fishing throughout the winter and 99% of the time I’m bass fishing, and I still do it for fun. If I don’t have tournament, I still just go fishing. It was probably this past May, we had the Toyota Texas Bass Classic at Lake Fork. The lake was on fire, everybody was smoking them, I had 110 pounds (over three days of competition, a world record). I had 42 pounds on one day, that’s the biggest one-bag catch that I have ever caught. That 110 pounds is a record, before that it was like 83 pounds. What’s the largest bass you’ve ever caught? I caught one about 14 pounds, but it was not in a tournament. Caught that on a guiding trip on Lake Falcon. The biggest in a tournament was a 12-and-a-quarter pounder on Lake Amistad back in the nineties. Any kind of cranking, jig. I like to move, I don’t like to sit, I don’t like to fish slow, I like to fish fast. I’ve had some good tournaments drop-shotting for smallmouths, but if I have to finesse fish for largemouth, I just won’t do it, but for smallmouth that’s the dominant way to catch them. On largemouth it’s like a check, I feel like I’m fishing for a check. Three lures you’re most confident in and rely on? ½-ounce Strike King black/blue Hack Attack jig. Do you have much experience fishing on Lake Hartwell? I went there for the first time in early December, and I stayed for 11 days. I did more scouting than fishing, but I fished for 3-5 hours each day. I looked at hartwell on a paper map and on the internet, took 3-5 days scouting it. Once I got there, I was overwhelmed with how big it was and how big it fishes. It turned a five-day trip into an 11-day trip. It’s a huge lake. Safe assumption that you don’t normally spend that much time scouting out a lake? Usually if I go on a pre-practice ride, five days would be long, but Hartwell is just massive. What makes it so big is that fish could be anywhere from the bank to 50 feet of water, they catch fish at a variety of depths there. Looking at past tournament records, there’s submerged timber, so many boat docks…it’s probably the most complicated lake I’ve ever been on. It’s also big because it just has so many miles of shoreline, so many offshore features…it’s complicated. On the shorelines, there’s hundreds, thousands of boat docks. With so many potential spots, how do you narrow them down and pinpoint a strategy in the pre-practice days leading into the Classic? You should be all in for the win at that tournament as it doesn’t count for points, and you only get so many chances to win the Classic. I think the first few days on the water I’m definitely going to try and fish my strengths, if I can develop a pattern around my strong suits, than I have a better chance of winning. I’m going to try and make ‘em bite, I know how to catch ‘em, but if that doesn’t work then I’ll try plan B. Occasionally you fish a tournament and it’s more about getting points than about trying to win, but the Classic you got to go for broke. But I’ll try to develop a crankbait or jerkbait pattern. Try to fish them like I know how to catch them instead of trying to figure out how to fish a regional style that they do there. What tournaments are you looking forward to the most this year? I’m anxious to see California Delta, I’ve never fished there, but it’s exciting because I know big fish come out of there. Guntersville in April, looking forward to that. 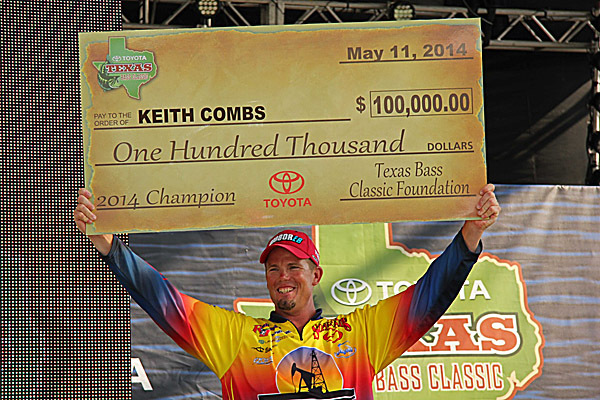 Number one, though, is the Texas Bass Classic on Lake Fork in May.